Slice a very thin layer from the bottom of each fennel bulb using a vegetable peeler or paring knife, leaving the core in place to help hold bulb intact. Remove fennel stalks, reserving fronds. Slice bulbs vertically into 1/4-inch slices. Brush slices with 1 tablespoon olive oil and sprinkle with ground black pepper and salt on each side. 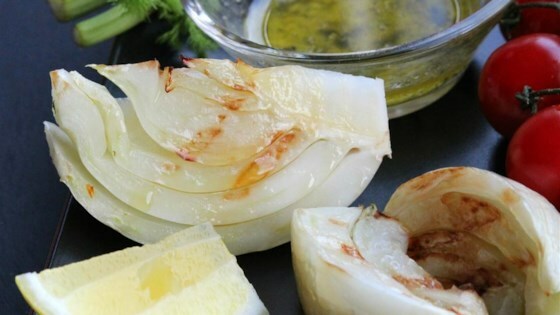 Grill fennel slices until charred, about 5 minutes per side; transfer to serving platter. Whisk remaining 1 tablespoon olive oil, basil, parsley, lemon juice, lemon zest, freshly ground black pepper, thyme, and reserved fennel fronds together in a bowl. Sprinkle Parmesan cheese and drizzle lemon mixture over fennel. Make sure to get just the yellow part of the rind, and none of the white pith, when zesting lemon. A nice twist on cooked fennel. Serve extra "dressing" on the side; it's delicious as a dip for bread too! :-) Thank you for the recipe.